It seems like we blinked this year and now it's November. Classically my favorite month out of the year — it always sneaks right up, signifying the busy holiday season is here. Before plunging head deep into the holiday spirit, we wanted to take the time to share a quick recap of our weekend and Halloween festivities. When it came to this year's decorating choice, I'd seen and loved the idea of "masking" our pumpkins here & here. 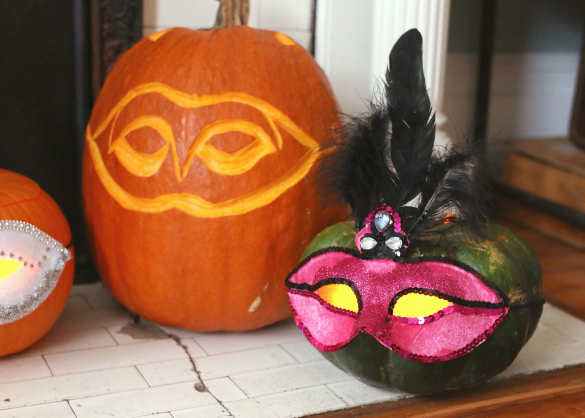 Using this concept as inspiration we picked up a couple of fancy masquerade style masks to pair with two of our medium to smaller sized pumpkins. 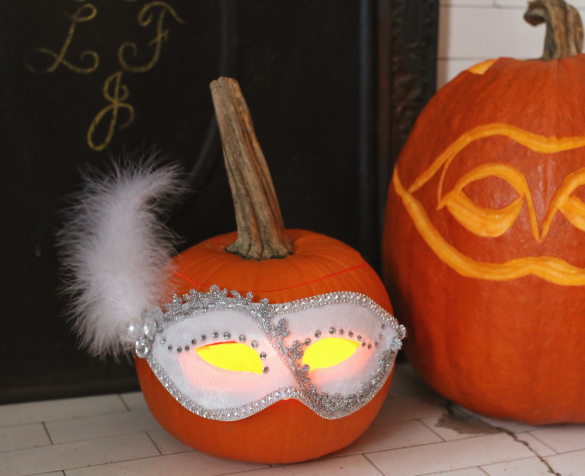 For a glowing effect, we hollowed the pumpkins and carved a crescent-shaped slit positioned directly underneath the mask eyes. To add a little variety, I carved the shape of a mask into the larger Jack-o-Lantern using a linocut tool, which allows for more precision when cutting freehand and scooping deep into the pumpkin flesh without breaking all the way through. The end result is something that looks like a glowing drawing. 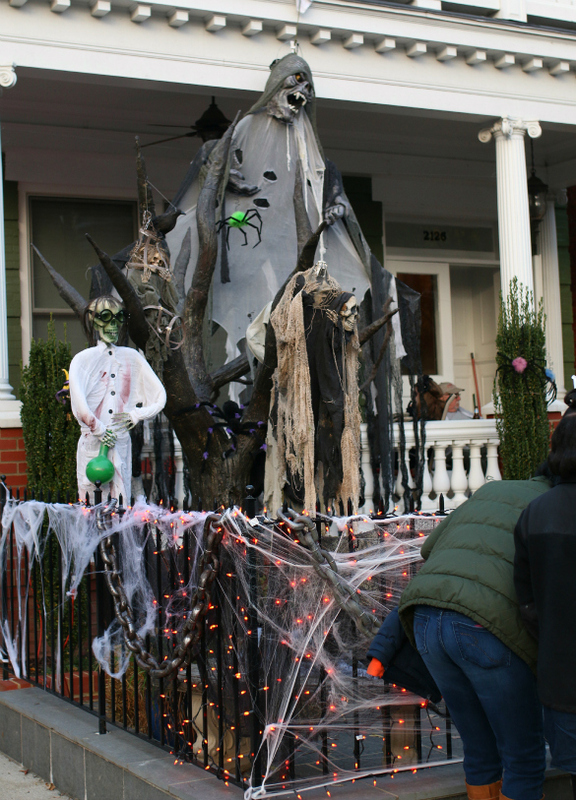 One of our favorite traditions since moving the Fan has been walking over to Hanover Avenue to get a glimpse at all of the over-the-top Halloween decorations. 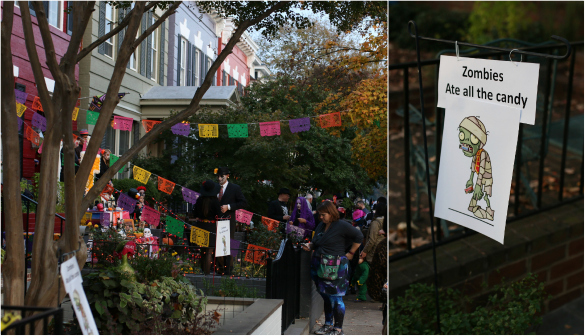 It's a true event on this street, where the road is temporarily closed and neighbors participate in friendly decorating competitions. 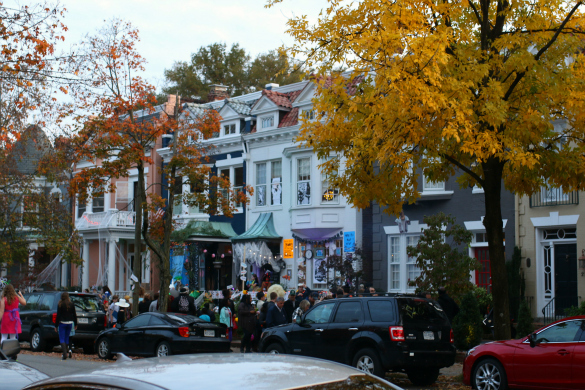 We typically stroll Hanover Ave during Halloween morning as a way to see everything going up while the streets are still quiet. Check out a full recap of these walks with details of the crazy decor in last year's Halloween post. This year we met Stephanie and a group of her friends closer to 5pm when things got started as a way to share the fun that happens in our neighborhood with them. After strolling the neighborhood, we hunkered down back home to hand out candy and delight in watching all the little trick-or-treaters that came our way, one of which turned out to be our nephew, Benjamin! 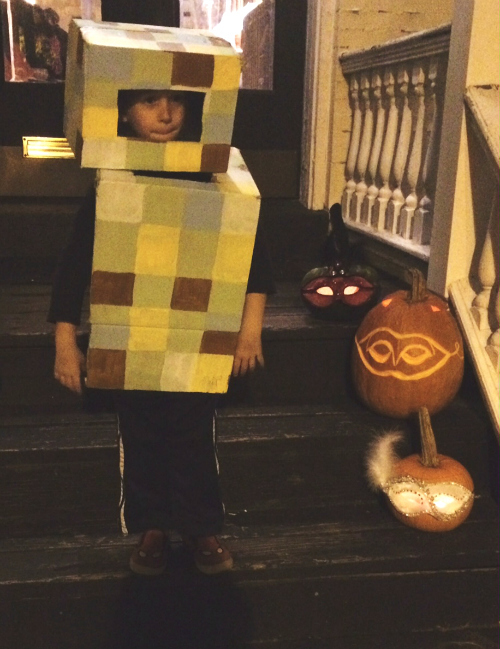 He'd asked for a Minecraft Zombie costume this year. Admittedly I'm not as familiar with Minecraft so took to Pinterest for help. After landing on this inspiration shot, we were good to go with a couple of cardboard boxes, checkered paint and a few strategically placed arm and eye holes. Not bad! We were so tickled that my mom drove him down to the city for a little house call in his homemade costume — definitely one of our favorite highlights to wrap up this year's Halloween. You can't win them all! 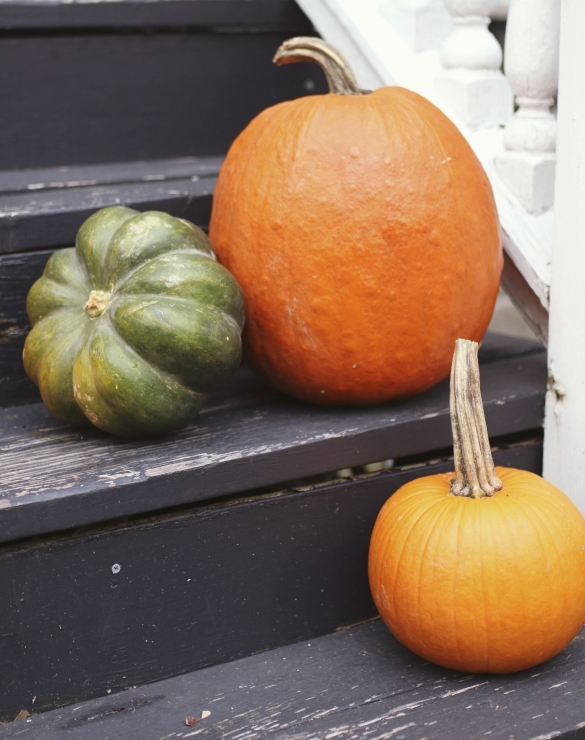 Thanks for checking in on us today — here's hoping you had a wonderful weekend and a great start to November. 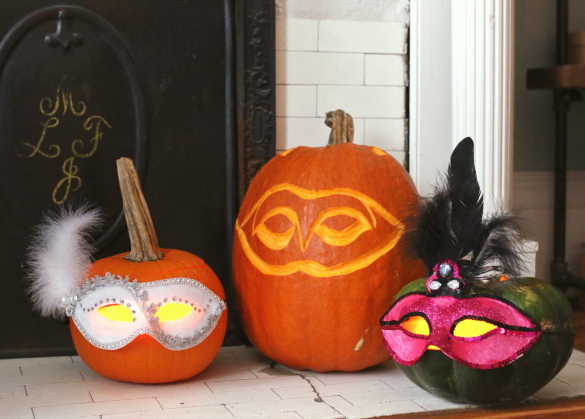 Love the fun pumpkin mask idea! You could really get creative with that theme for sure.